Algae isn’t just found in your garden pond or local river. Sometimes it explodes into vast “blooms” far out to sea, that can be the size of a small country. Such algal blooms can match even a rainforest at taking carbon out of the air. And then, in just a week or two, they are gone – sometimes consumed by viruses. Given the scale of blooms and their vital role in both marine ecology and climate regulation we must know more about these viruses. Research conducted with our Weizmann Institute colleague Yoav Lehahn and others and published in the journal Current Biology, is the first attempt to quantify the affect of viruses on large scale algal blooms. Algae in this context refers to tiny sea organisms known as phytoplankton which exist right at the bottom of the marine food web, providing the ultimate source of all organic matter in the sea. They do this by consuming carbon dioxide during photosynthesis, “fixing” this carbon into organic matter (themselves) in the same way trees take carbon out of the air. Therefore phytoplankton serve as a major sink, or “biological pump”, of atmospheric CO2. Some studies show that, although they account for less than 1% of the photosynthetic biomass on Earth, phytoplankton fix almost half of the world’s total organic carbon. 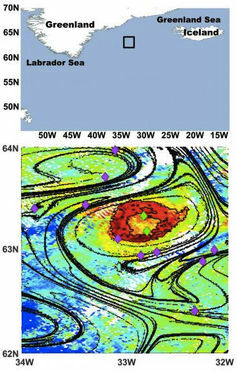 Blooms in the ocean are controlled by two processes. First, the biological or ecological factors – the interplay between nutrients, predators and pathogens. More nutrients means more algae; more algae-eating fish, or algae-attacking viruses means fewer blooms. And then you have the physical processes – the stability of the upper ocean and the temperature and salinity of the water and the speed of its currents. In our study, we developed an approach to trace and follow unique patches of plankton blooms in which the physical conditions are almost constant. Such patches can be viewed as unique ecosystems in which any changes can be attributed mainly to biological or ecological processes. We used satellite data over such a patch in the North Atlantic to track the whole life cycle of a bloom in a phytoplankton species called Emiliania huxleyi. We are able to do this as satellites are able to detect the presence in water of pigments such as chlorophyll used for photosynthesis. The physical properties of this patch were stable throughout the life of the bloom – the sea didn’t suddenly change temperature, get more salty or drift in an unusual direction. Therefore we know that most changes in the algae were caused by biological processes. Recent studies of marine microbiology showed viruses play a key role in regulating algae populations, killing off algal blooms in the same way viruses regulate human populations during an epidemic. Such processes were documented in the lab and in local measurements in confined zones in the ocean. But what was missing was real-world verification over large scale natural bloom. We wanted to find a mass viral-induced phytoplankton demise in nature. We set out to find a unique fingerprint of a virus-driven demise and to use this to measure the impact of viruses on large scale oceanic blooms. Combining satellite data with field measurements of viral activity during an algal bloom in the North Atlantic ocean allowed us to conclude that the demise of this specific bloom was due to viral infection. We used this newly established method of following the complete life cycles of a distinct bloom to estimate the amount of carbon that is turned over by viruses that infect this bloom. We were able to calculate the life-span of this phenomenon and how it has been affected by viral infection. An algal patch with an area of around 1,000 km2 can “fix” around 24,000 tons of organic carbon throughout its life time. This is equivalent to a similarly sized patch of rain forest. And this is, of course, only one patch out of many. The big impact viruses have on entire ecosystems was already well known. But now, for the first time, we can quantify their immense impact on open ocean blooms: in just two weeks such viruses can “consume” a huge algal bloom that harbours many tons of carbon. The exact fate of the organic carbon that is realised by viral attack is not clear. Most of it is probably recycled back into the atmosphere by bacteria that use the organic carbon as substrates for respiration (a process called The Viral Shunt). Another option is that the viral infection release sticky molecules like sugars and lipids which make organic carbon sink faster to the ocean bed. If the latter scenario is true it will have a profound impact on the efficiency of CO2 “pumping” from the atmosphere to the deep ocean. This carbon will have a better chance of being buried in the ocean sediment. The ability to quantify viral infections from space, and the rapid timing of this bloom demise on such large scales holds a promise for understating the fate of carbon in the oceans. Assaf Vardi, Senior Scientist, Department of Plant Sciences at Weizmann Institute of Science, receives funding from the European Research Council (ERC). Ilan Koren, Professor, Department of Earth and Planetary Sciences at Weizmann Institute of Science, receives funding from European Research Council (ERC).